If you’re losing sleep, you may be suffering from anxiety. On the other hand, if you’re suffering from anxiety, it might be because you’re losing sleep. And if you’re already anxiety prone, then losing sleep has been found to significantly make that anxiety worse. Over two-thirds of of adults suffer or have suffered from anxiety, and according the Anxiety and Depression Society of America, over three-fourths of those who do, experience at least one anxiety-related sleep disturbance per week. And that can lead to more anxiety and more lost sleep and loss of focus and concentration and so on and so forth, ad nauseam. Used for centuries as a calming herb, several modern-day studies have indicated the plant’s validity as an anxiety-reliever. There is some evidence that passionflower may help alleviate insomnia. However, there is even better evidence that passionflower relieves anxiety. Composure is high in antioxidants, especially in vitexin (from passionflower) shown to relieve inflammatory pain in mice. A study published in the American Journal of Physiology Regulatory, Integrative and Comparative Physiology, found a link between low levels of antioxidants and poor sleep. There is also line of thought in science that inflammation can affect your mood, causing anxiety, depression both result in sleep loss. (Read the Science Here). Oatstraw, horsetail (Shavegrass) and slippery elm are a few of the other good sources of flavonoids and antioxidants found in Composure. Both slippery elm and marshmallow root contain polysaccharides which have demulcent properties. 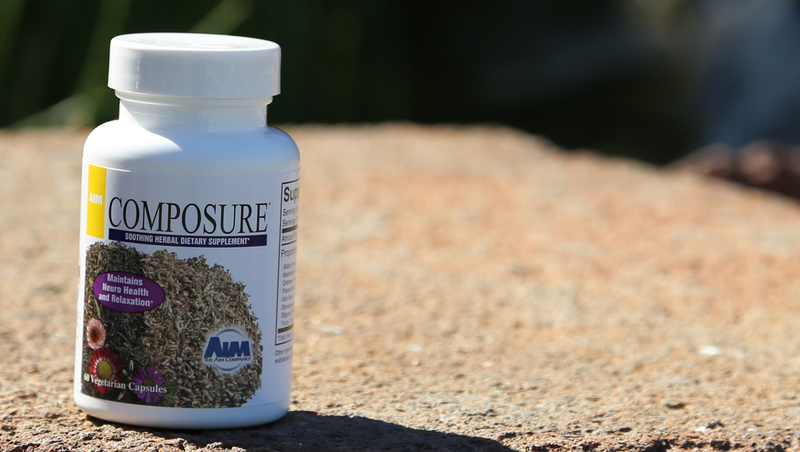 They protect the lining of the gut, and this keeps the stomach from becoming too acidic, defending your gut flora. (Note: This is only beneficial if you have a healthy gut flora). An earlier study has shown that probiotic usage and a healthy gut improves moods which may help you sleep easier. At the same time, I’ve read not to take other AIM products with Herbal Fiberblend®, because the fiber will cause you not to aborb the nutrients.